*These carry on business. Of those not marked about one-half work as Journeyman, and the rest from choice or necessity follow other occupations. Confectioner One whose occupation it is to make or sell confections, which are preparations of fruits preserved with sugar, such as peaches, pears, melons, nuts, orange peels, etc., and/or sugar candies. Mantua maker A dress maker – A Mantua was a loose gown worn over a petticoat and open down the front. Paperhanger An interior decorator who put up wallpaper. Stevedore A dock worker or labourer who unloads and loads ships’ cargoes. Wheelwright Made or repaired wheels; wheeled carriages, etc. Whitewasher Whitewasher: One who whitewashes by using a composition of water and lime or sizing to whiten walls, ceilings, etc. Source: Septennial Census Returns, 1779–1863. Box 1026, microfilm, 14 rolls. Records of the House of Representatives. Records of the General Assembly, Record Group 7. Pennsylvania Historical and Museum Commission, Harrisburg, PA.
A few more posts for 1863. The following covers Wards 10 thru 12. At a later date, I will attempt to find the individuals in this Census with the 1860 and 1870 Census. An earlier attempt was not fruitful but I will try again to draw connections and attach these individuals with their census records. There is so much to do – continue with older Septennial censuses, attempt to connect with the Federal census and I’m also working on posting a Trades census for Colored People. I hope this finds someone who can find this information useful. It certainly is helpful to me in that even if I do not find ancestors, I know I’ve been through the entire census. 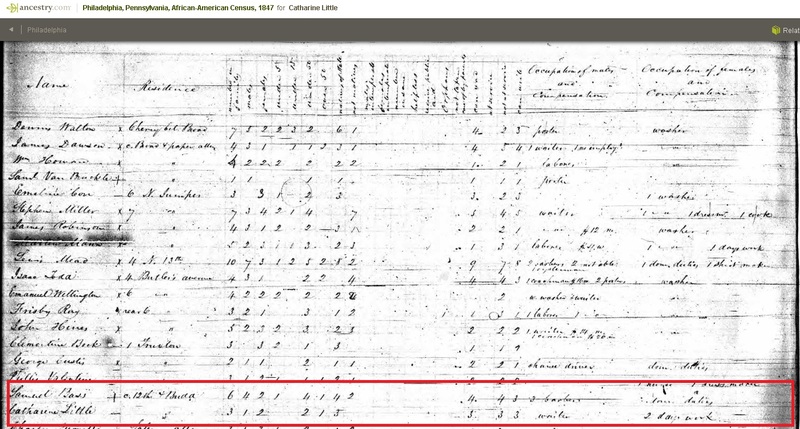 However, this census did lead to who I believe is a 5th great grand uncle. A pattern emerging maybe…an urban/suburban devide? As we move farther away from the city center, the number of free people of color declines. One draw back in the methodology of the Census is that it was completed based on alphabetical order. No addresses are attached. However, the wards are broken down into divisions (this system is still in place today) so you can get a general sense of pockets of African Americans. In some wards and in many divisions there are no African Americans residing. Please spread the word. I hope this information will be useful for someone. But more importantly I’m trying to find other genealogists that share my interest in African Americans in Philadelphia and/or New Jersey in the 18th and 19th centuries. Below is Ward 8.